Equity Valuation for Analysts and Investors introduces you to the financial statement analysis and model-building methodology used by leading equity research firm Argus Research. Written by Jim Kelleher, the company's director of research, the book offers the tools for estimating individual equity cash value. These include a completely original and proprietary valuation methodology, Peer Derived Value, which values an equity based on the stock's current variation from its historical relation to a user-specifi ed peer group. Valuing and predicting the future value of assets and stocks is a laborious task. Successful analysts and investors don't have time for tedious work that is outdated as soon as it's done. 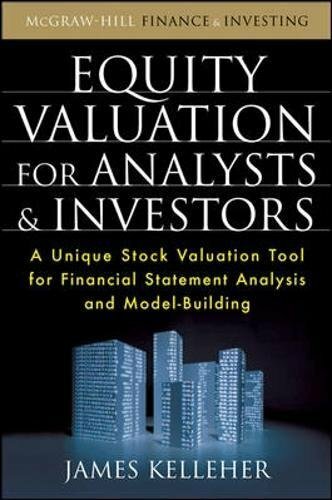 Equity Valuation for Analysts and Investors is the comprehensive guide to efficient financial statement analysis and model-building from one of the world-leading independent equity research firms, Argus Research. Master the art of "valuation choreography"
One of the biggest challenges to making accurate predictions with a valuation model today is the rapid and constant fluctuation of data. Equity Valuation for Analysts and Investors provides a tried-and-true process for creating effective, compact models that add new measurement and valuation periods and accommodate a company’s unique data presentation and reporting style. This versatile guidebook also provides both a rigorous process and a shortcut for each step in modeling financial statement data so analysts can customize their data focus based on their position in the value chain. When implemented in the real world, the valuation model uses the power of Excel to allow investors to quickly and accurately update their valuations and predictions by simply inputting adjusted data. Take control of your investments now by managing them based on your own research and Equity Valuation for Analysts and Investors. If you have any questions about this product by James Kelleher, contact us by completing and submitting the form below. If you are looking for a specif part number, please include it with your message.